Most of us are in no hurry to abandon our venerated annual traditions. For some of us, the Homecoming race is easily the highlight of our year. However, imagine a gathering in which we don’t race. Imagine a gathering in which the alumni, varsity, and novice rowers join forces; setting out on an epic adventure aboard the spectacular Stämpfli Express. Designed by Swiss manufacturer Stämpfli, the Stämpfli Express is a 24 seat rowing shell that was constructed as part of an attempt to break the world record for the 2,000m at the 2001 World Championships. The boat still exists and is occasionally rented by European rowing clubs. It might take a while before Murray State gets the opportunity to take this 24 seat boat out on Kentucky Lake. 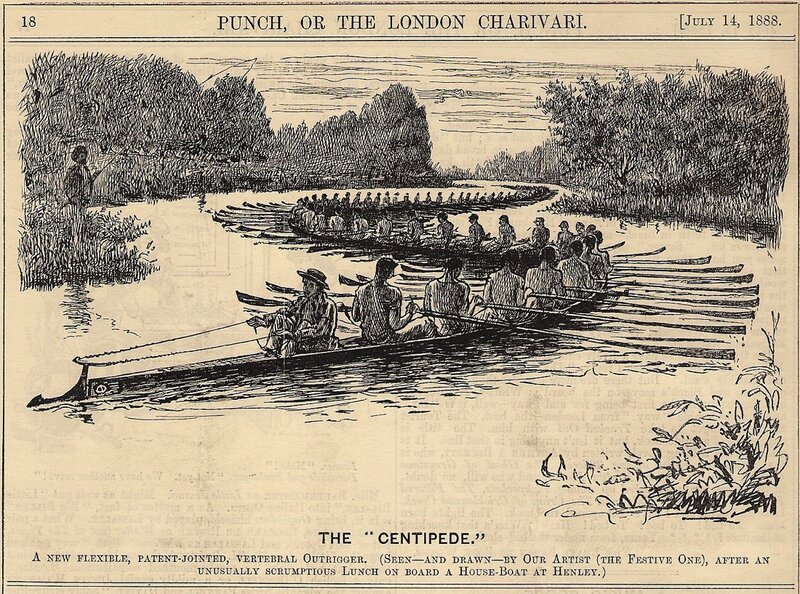 But, perhaps demand for a spindly, impractical rowing shell will increase as bigger, weirder boats are put in the water. Should an Internet rumor be believed, a French boat builder is working on a flexible shell that will seat 50 rowers. Allegedly, the Quinquaginta will be capable of snaking around the narrow curves and sharp bends of smaller bodies of water (source). While undeniable oddities within our sport, boats with many seats and flexible bodies are not a new idea. 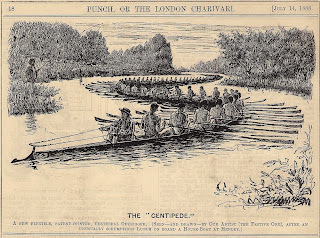 An illustration in Punch, an 1888 British magazine, depicts a boat called The Centipede.